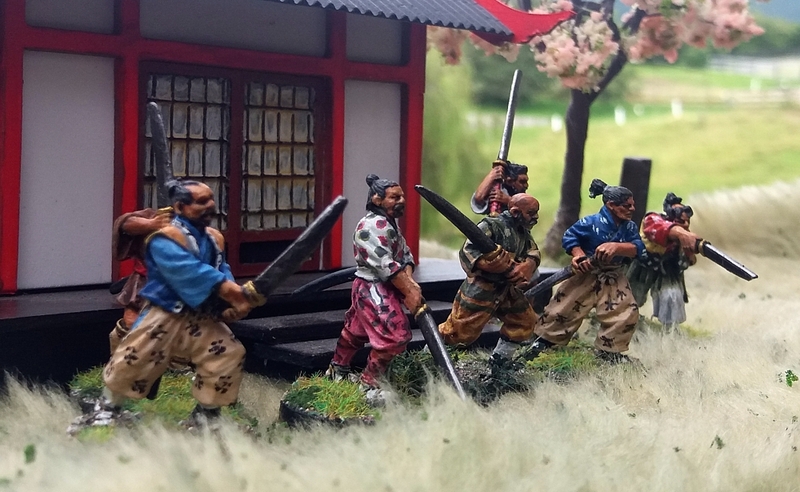 I’ve been wargaming since the 1990s, and during that time have amassed many miniatures across a range of periods. However, I’ve never really catalogued them all, and some of them haven’t seen the light of day for many a year. So I’ve decided that over the next few weeks I’m going to parade each army for inspection, and take stock of what I’ve got. 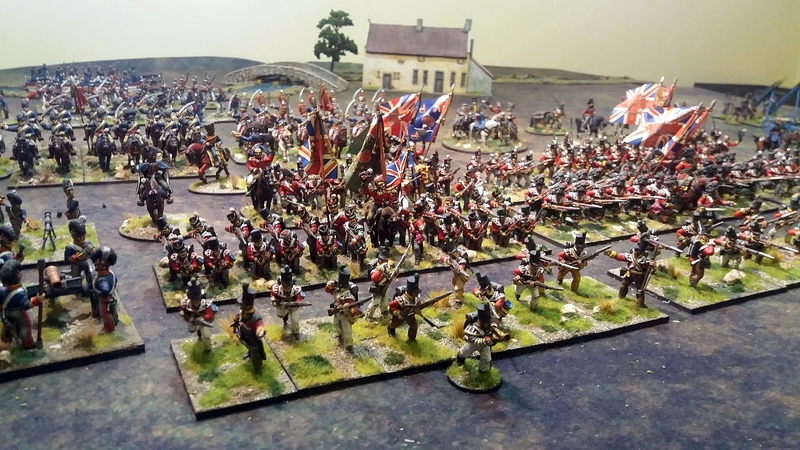 From 2003 to about 2009 I collected a British army of the Napoleonic period. It hasn’t seen very much wargaming action since then, so I thought this might be a good army to start my inspection tour. Of course, every army has to have a commander. And if you’re playing British, why not go to the very top – the Duke of Wellington himself. 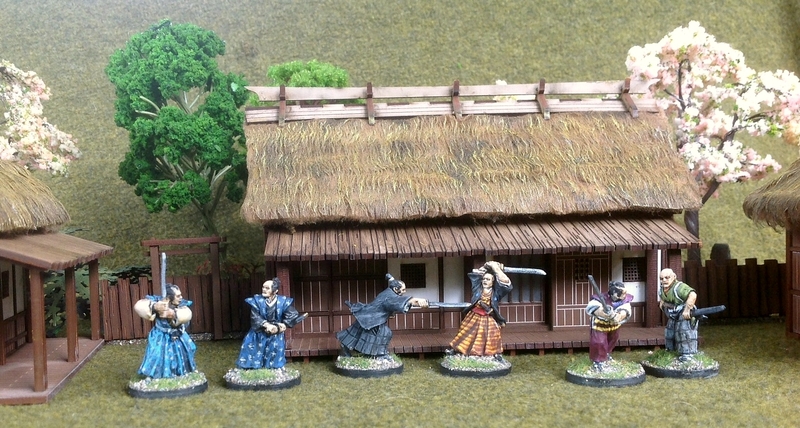 This is a lovely set produced by Wargames Foundry. Circling clockwise from the instantly recognisable Duke himself, you can also see Captain von Streerwitz (2nd King’s German Legion Hussars, and aide-de-camp to Uxbridge); Lt-General Sir Thomas Picton (wearing civilian clothing as he did at Waterloo); Lt-General Sir Rowland Hill; an ADC on foot; and in the foreground, Lt-General the Earl of Uxbridge, who lost his leg at Waterloo. I obviously didn’t know much about painting horses’ eyes back then! In fact, the way I used to paint eyes on human figures at that time ended up with them looking like Thunderbirds puppets. Nowadays I just hint at eyes with some dark ink. 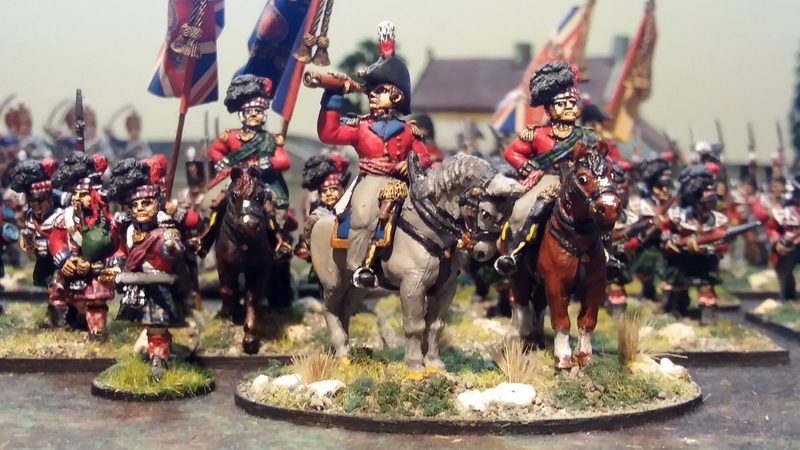 Also in the Wargames Foundry set are these four figures depicting a helmeted Dragoon Guards officer; Major-General Sir James Kempt; Major-General Sir Denis Pack; and Adjutant-General Sir Edward Barnes. 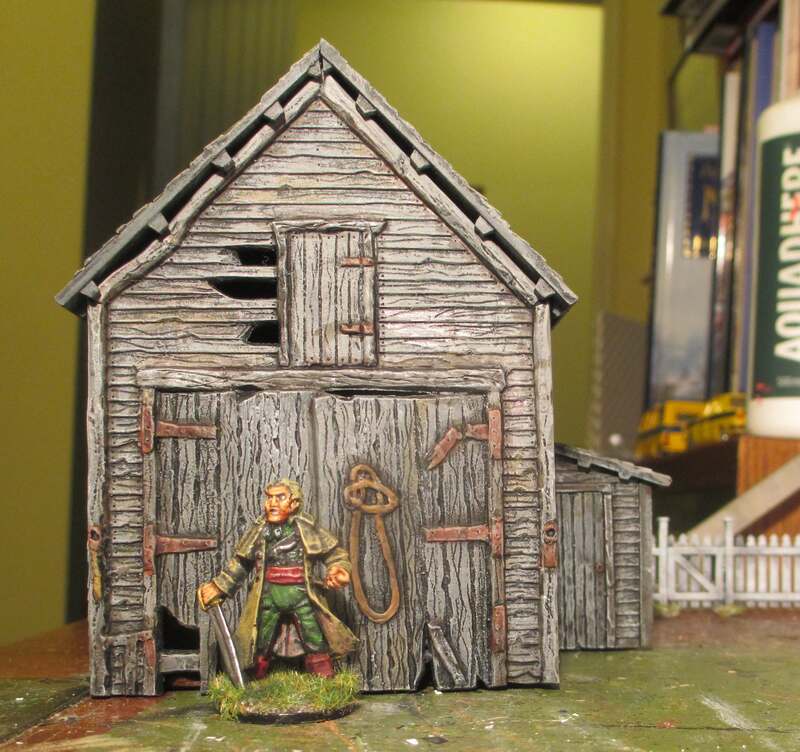 I painted this set in April 2003, using a simple block painting technique with very little attempt at shading or highlighting. I think this clean style actually stands the test of time surprisingly well (apart from those googly eyes!). 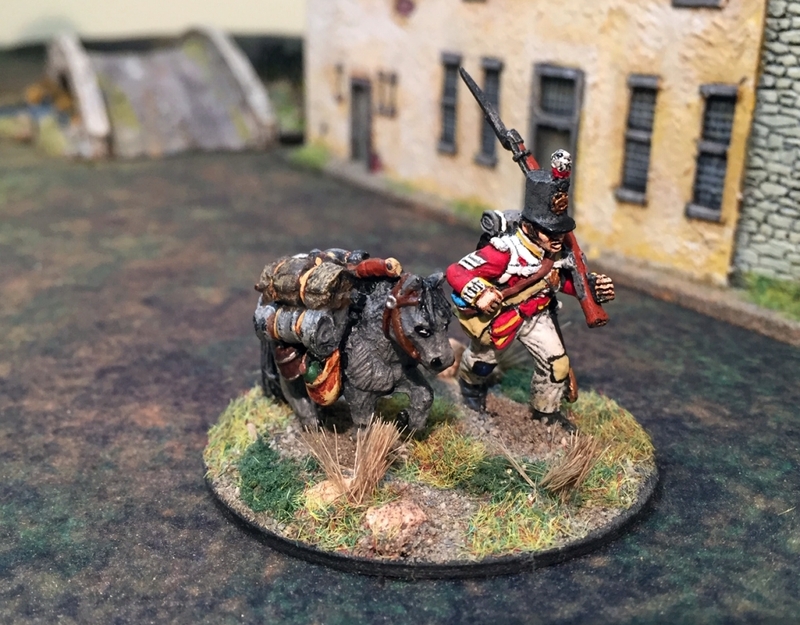 Here are some more command figures from my army – General Robert Crauford and a mounted officer of the 42nd Black Watch. 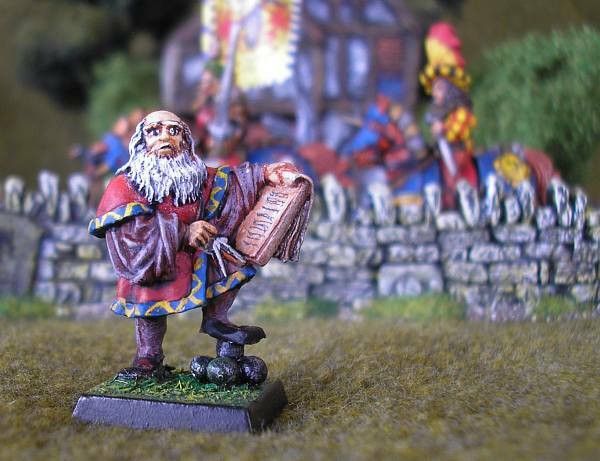 These are produced by Front Rank Miniatures, whose figures are a painter’s dream, with clean surfaces and crisp detailing. I always did wonder a bit about that pose of using a telescope one-handed. I would’ve thought that would make the view very shakey! 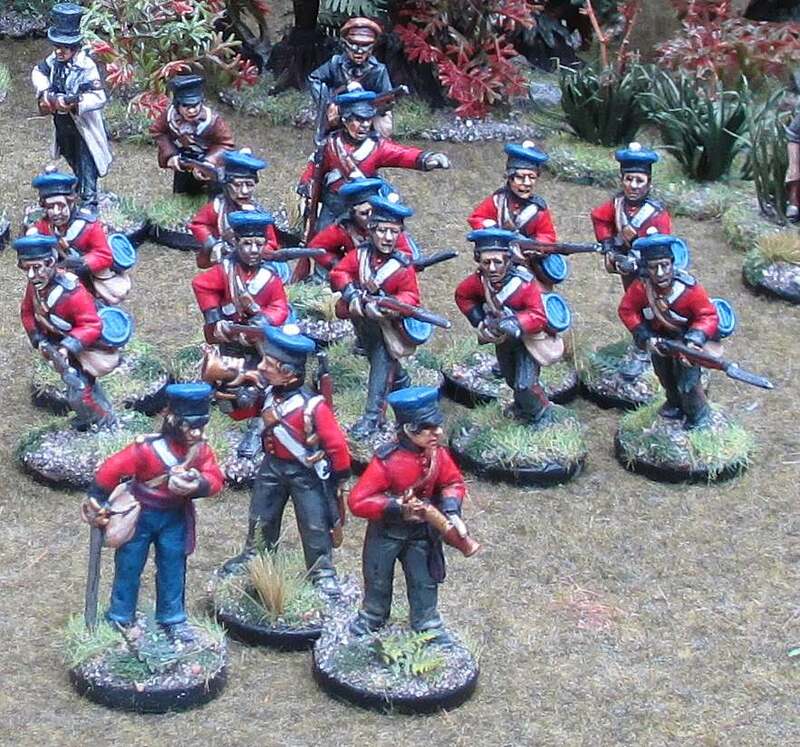 One of the pleasures of collecting a British army are those resplendent red coats worn by most of the infantry. This picture also shows how I break each infantry unit into six bases. 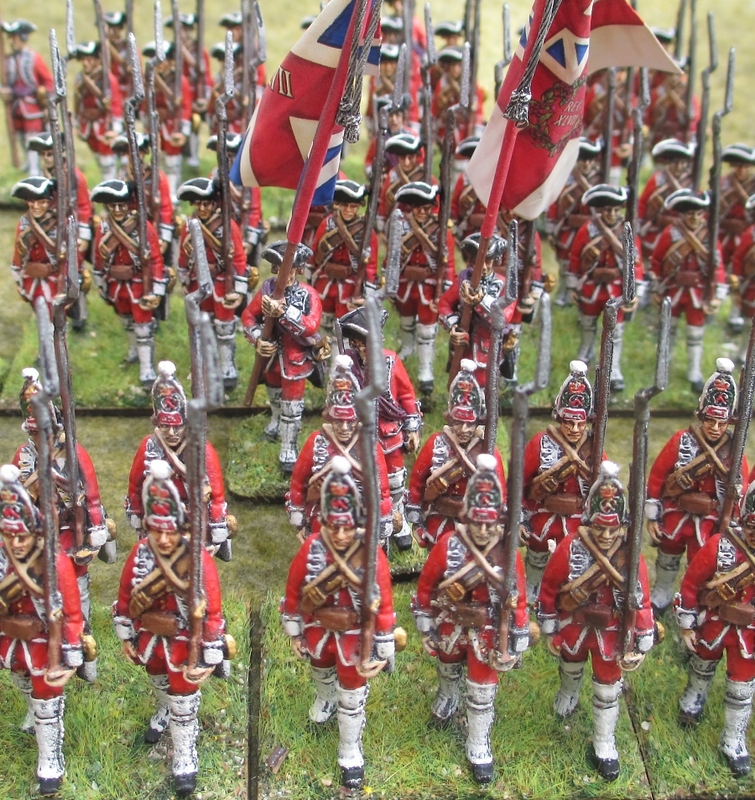 Regular infantry have about four figures per base, whilst light troops are represented by only two figures per base. In many rules the number of model figures per base doesn’t actually matter, as casualties are recorded by a set number of hits required to remove a base, rather than counting and removing actual figures. The other pleasure of a British army are the huge and stately colours (flags) carried by each battalion. 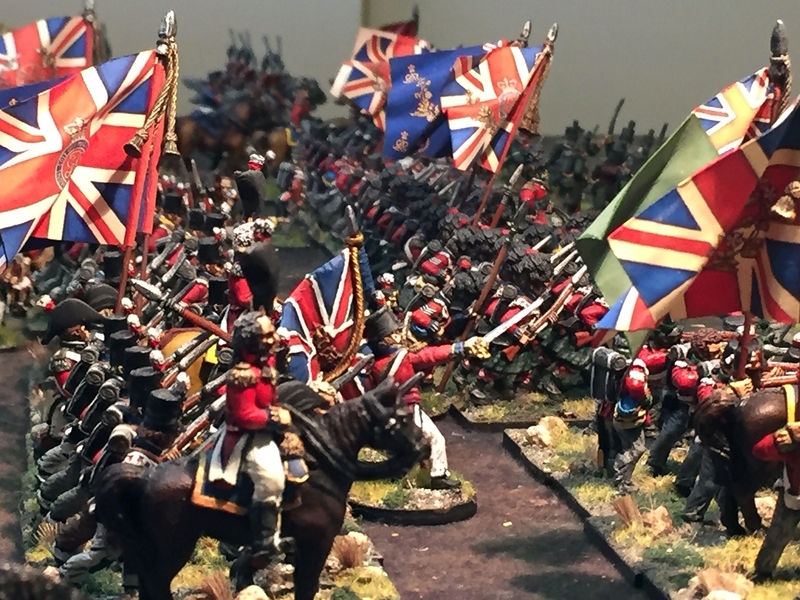 GMB Designs produce exquisite paper flags that really set off this army. 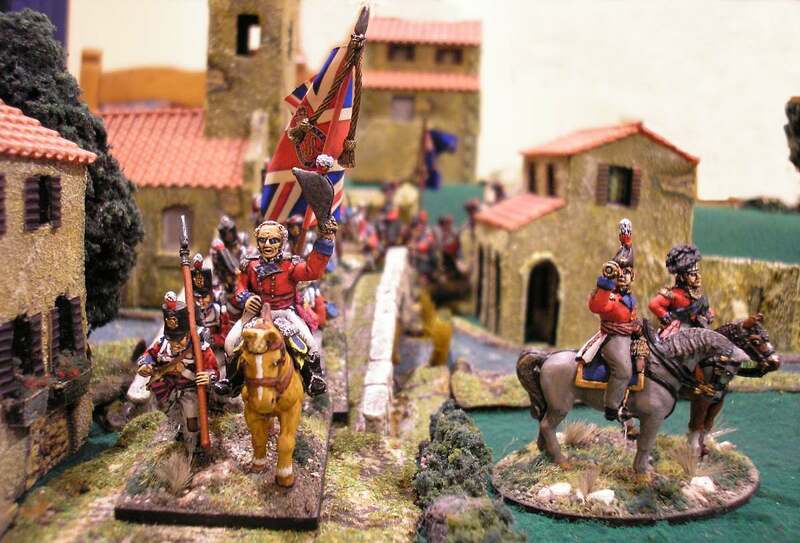 Note that I make my flags wave by curling them diagonally, rather than vertically like many other wargamers do. The diagonal fold gives them a more realistic draping effect. 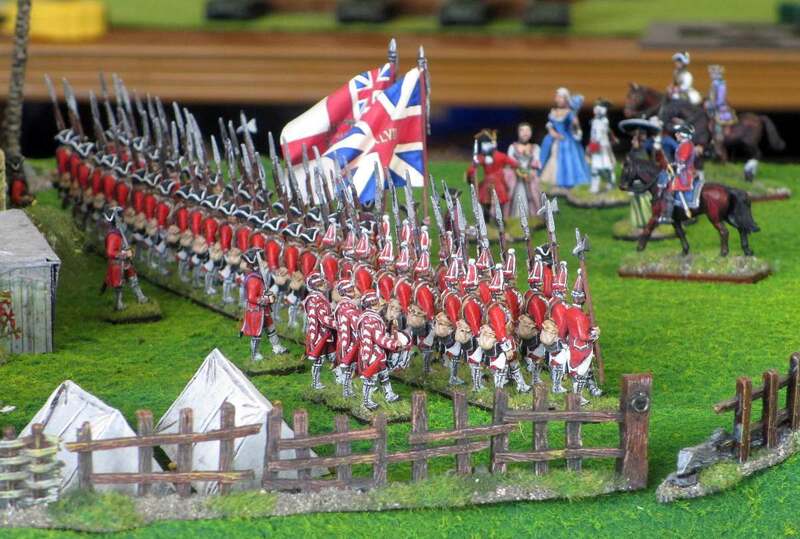 The smaller Union flag held by the chap in the middle of the photo is actually cast onto this metal Warlord Games figure, and had to be painted by hand. When I started my British army, I had a vague idea that instead of following any real-life order-of-battle, my force would represent the series of fictional ‘Sharpe’ novels by Bernard Cornwell. 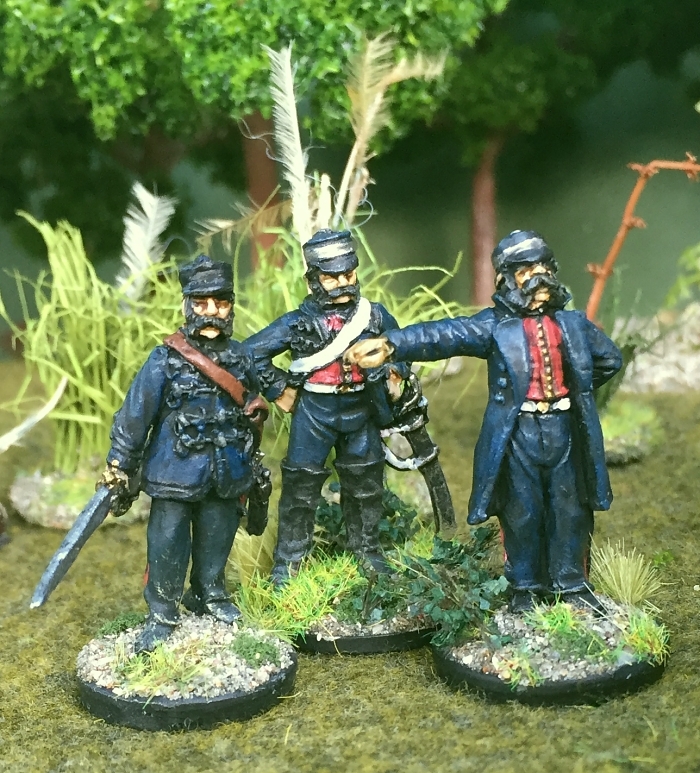 So these Front Rank 95th Rifles are led by Richard Sharpe himself (left), accompanied by his faithful Sergeant Patrick Harper (centre). 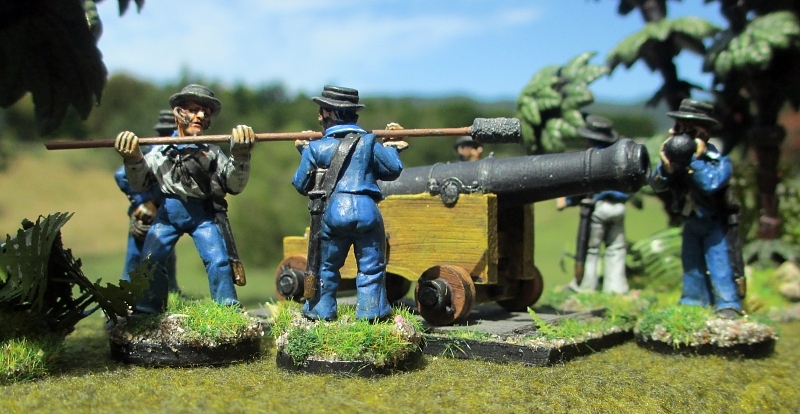 Both figures were made by Chiltern Miniatures (now defunct, but possibly available from SHQ Miniatures). The prone figure on the right isn’t a casualty, but a rifleman aiming his Baker rifle whilst lying on his back. 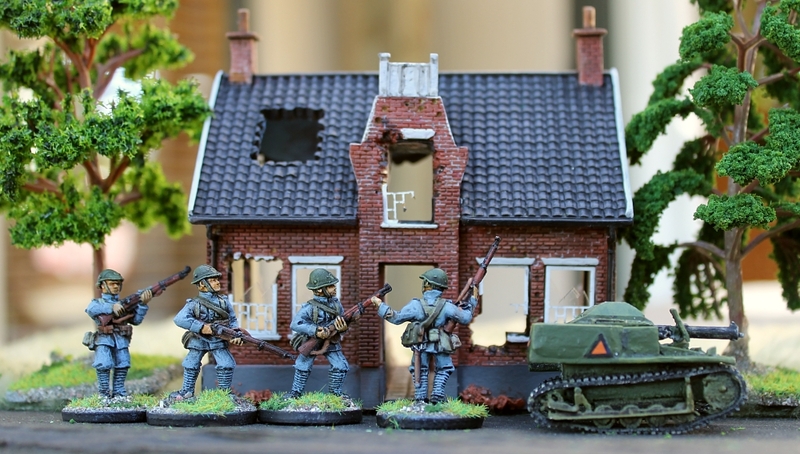 The 44th East Essex was the very first British unit I painted. Again, I had in mind the Sharpe novels and was planning on giving this yellow-faced unit an alternative flag for the fictional South Essex Regiment from the books – though I never got round to doing this in the end. This is one of my favourite units, the 42nd Black Watch. These are once again Front Rank figures. The individually based officer is a later addition to the unit. He’s a so-called ‘big man’ required for driving the action in the Sharp Practice rules for small-scale engagements. You’ll see that several of my units have had such single figures added. 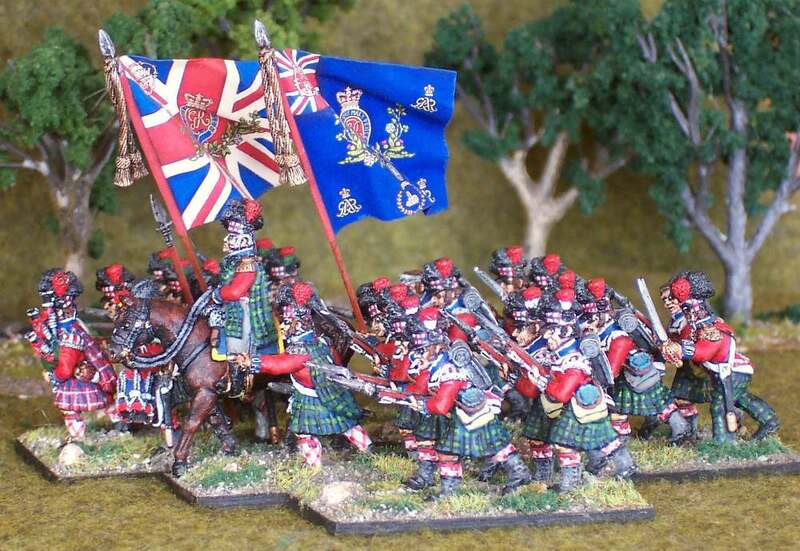 The challenge with painting Scots, of course, are those fiddly kilts. I’m really pleased how these came out, giving a nice impression of the Government tartan worn by the Black Watch. 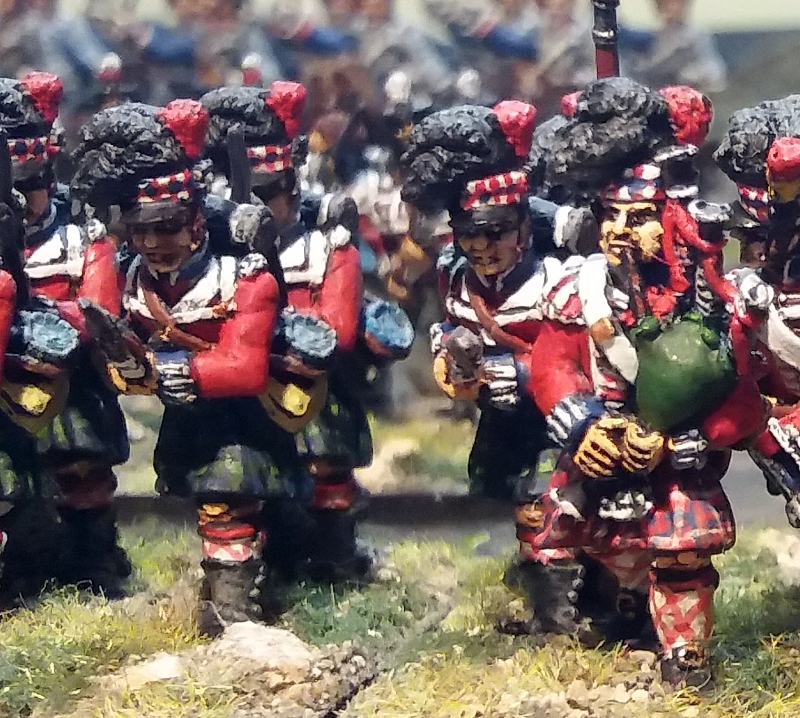 Since painting this unit many years ago, I’ve tried painting other figures wearing kilts, but have never again succeeded as well as I did with this unit. It’s odd how sometimes one’s painting skills seem to decrease with experience, rather than the other way round! And here’s yet another photo of my favourite unit, with the bagpiper leading the way. Note that the piper’s tartan is a different colour from the soldiers – this was actually the case in the 42nd. Those criss-cross stripey stockings were also a challenge to paint! Besides my five line infantry battalions, I’ve got a couple of units of light infantry, which (as mentioned above) only have two figures per base to represent skirmish order. My light infantry don’t carry colours, and the figures are posed much more haphazardly in various stages of loading and firing. 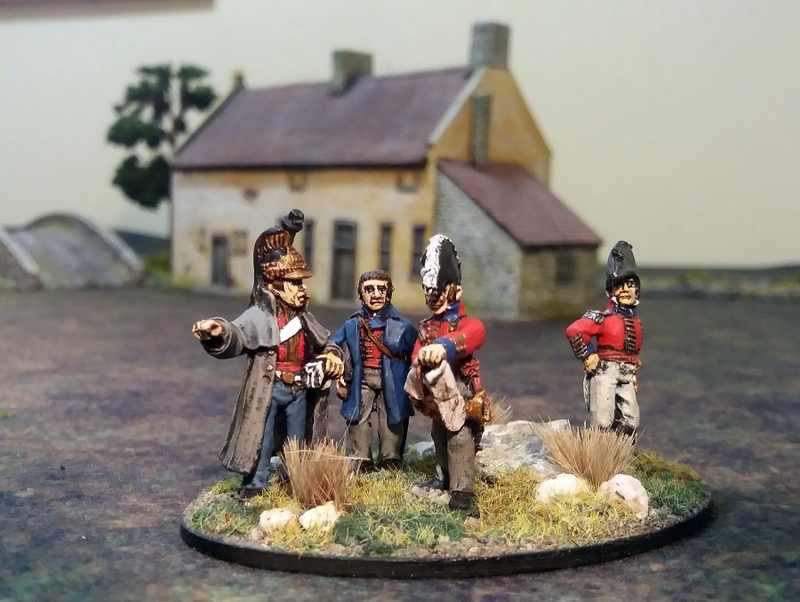 Here’s a close-up where you can see a couple of my light infantry ‘big men’ for Sharp Practice, in this case a bugler in a yellow jacket, and an officer with the typical metallic epaulettes of the light infantry. A sergeant with his private pack-donkey, no doubt carting some illicit loot away from the battle. Yeah, I know, my donkey looks more like a large dog giving his master a baleful sideways look! 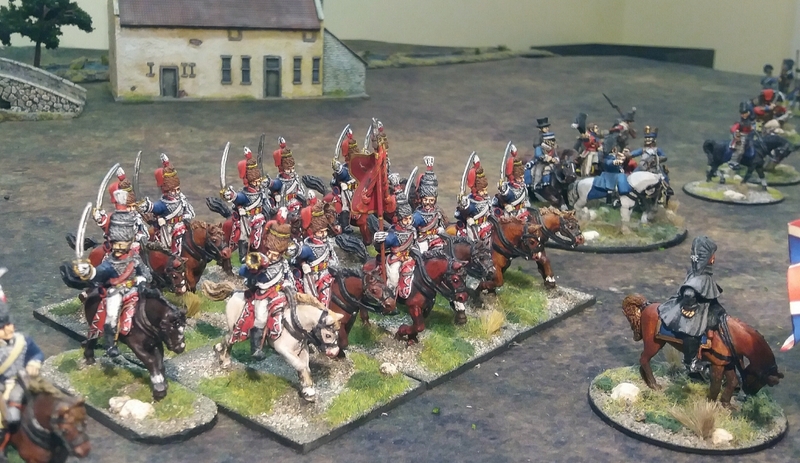 The most flamboyant figures in any Napoleonic army were the hussars, and the British were no exception. 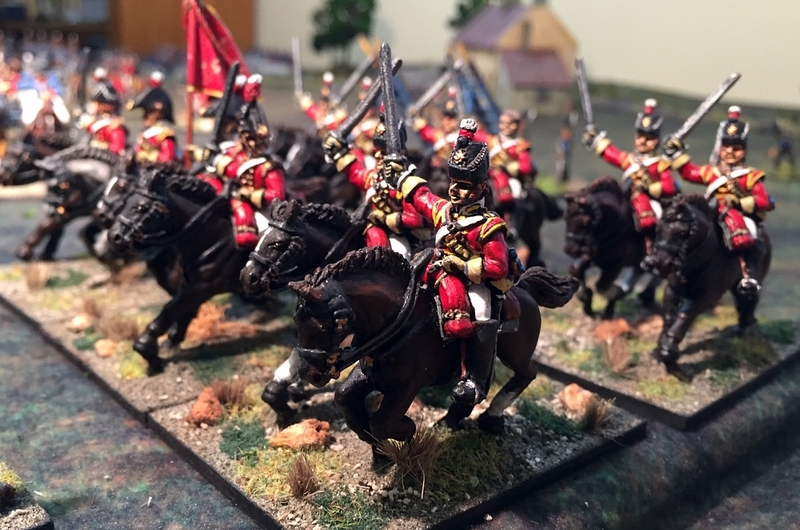 I chose to paint these Front Rank figures as the 10th (Prince of Wale’s Own) Hussars. 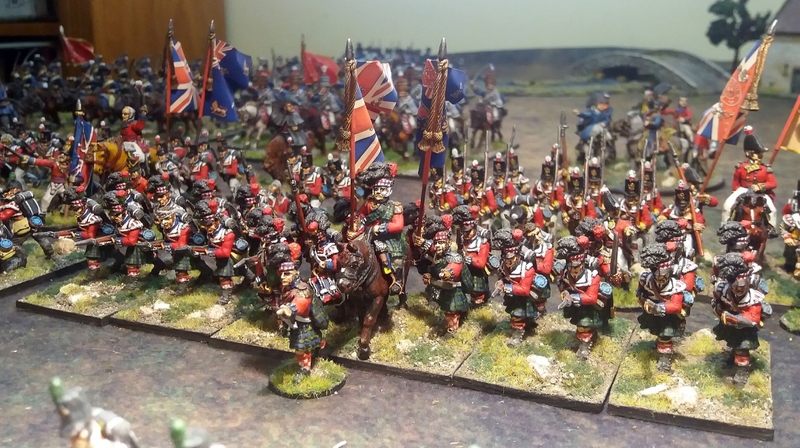 The reason for choosing this particular regiment was simply because I recalled as a teenager assembling and painting a 54mm Airfix 10th Hussar plastic kitset! 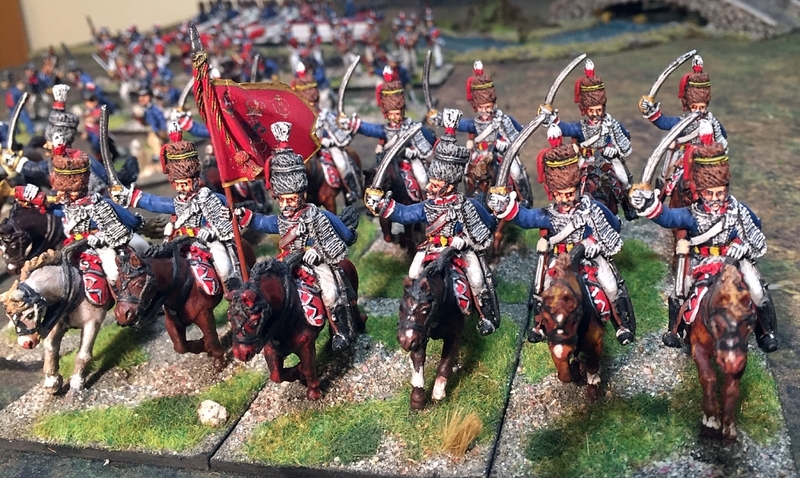 Hussars are rather difficult to paint, but it’s definitely worth the effort for the panache they bring to the table! 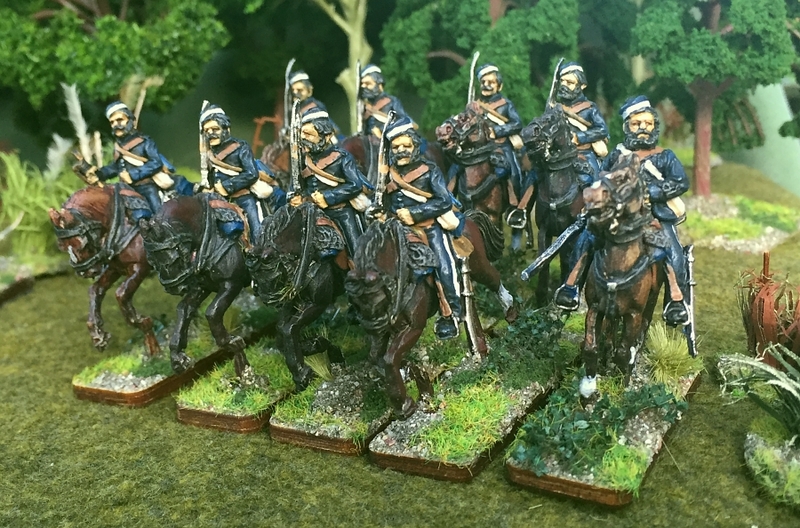 Much more sombre light cavalry than the hussars are these light dragoons. 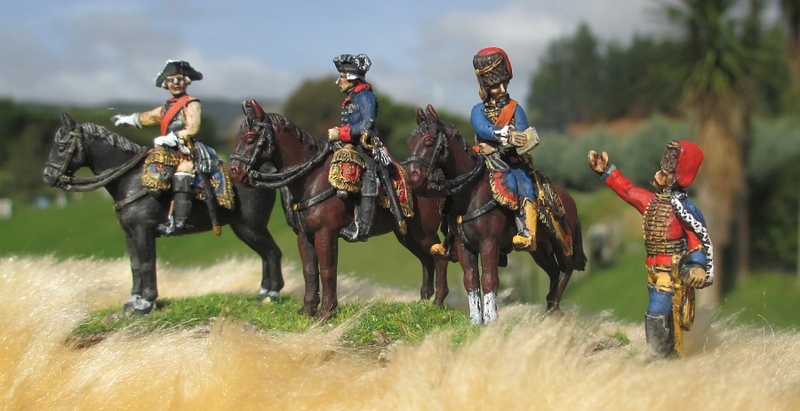 They’re wearing an early uniform with the Tarleton helmet – in the latter parts of the Napoleonic Wars they wore shakos. On the right is another of my command bases, showing a mounted messenger handing orders to a light dragoon officer in the later uniform. Now for the heavies! 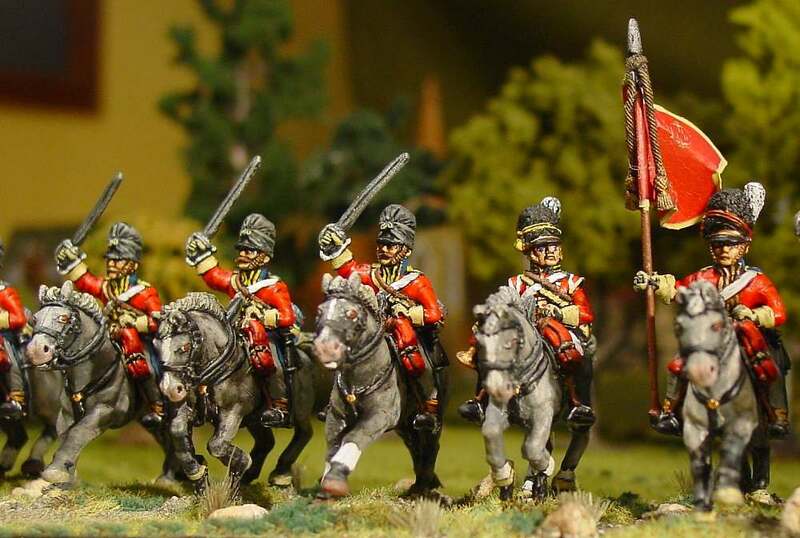 These dragoons are once again wearing an earlier uniform, rather than the later uniform with the classical-style helmets. My horses, by the way, are all painted with oil paints. I paint the entire horse with a light highlight colour, wait for it to dry, then paint it with a darker colour and immediately wipe it off with a clean cloth so the highlight colour shows through. This photo is somewhat reminiscent of the famous painting ‘Scotland Forever!’ by Lady Butler, depicting the charge of the Royal North British Dragoons (or Scots Greys) at Waterloo. In reality the Scots Greys didn’t charge at the gallop due to the broken ground, and instead advanced at a quick walk – though nevertheless they did capture the eagle of the 45e Régiment de Ligne. By the way, the Scots Greys didn’t get their nickname from their grey horses, but from an earlier grey uniform they wore in the 17th century. 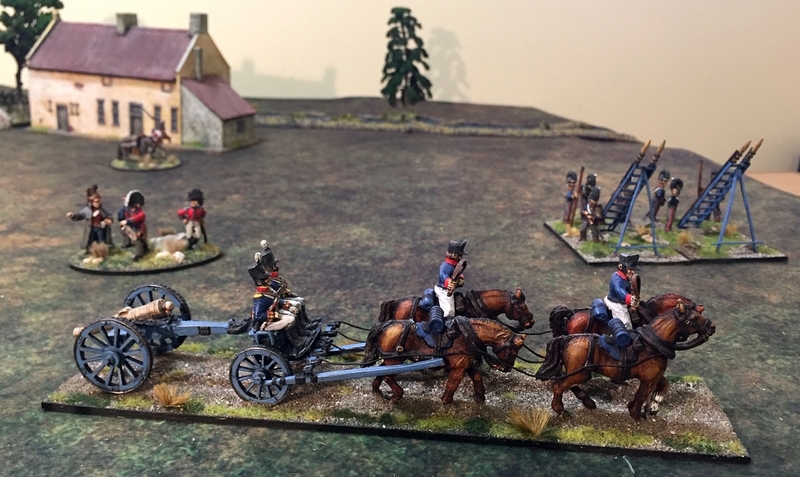 The artillery gives some heavy firepower to my British army. 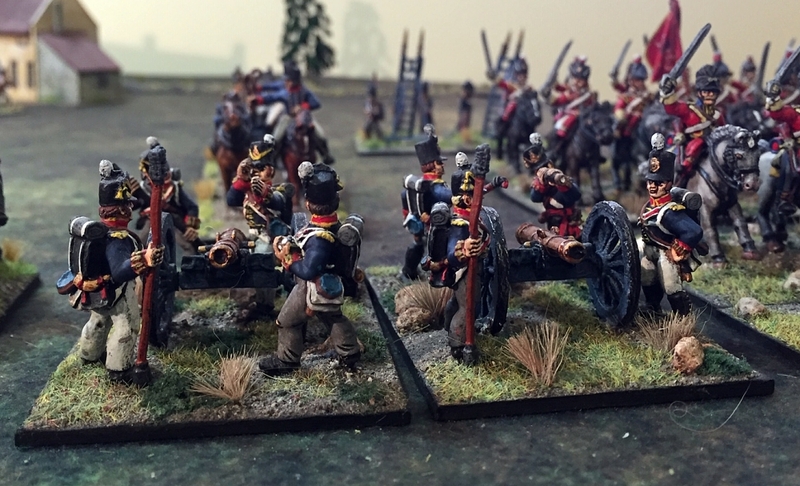 Unlike the redcoat infantry, the Royal Artillery wore blue uniforms. 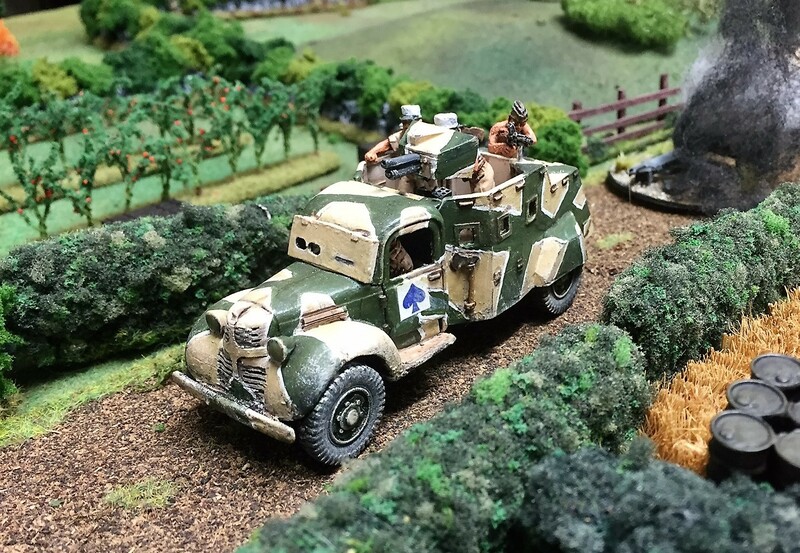 These figures and guns are once again from the ubiquitous Front Rank. The Royal Horse Artillery wore a snazzier uniform than their foot artillery compatriots. The Tarleton helmet looks impressive, but I wonder how practical it was to keep on in the heat of loading and firing the guns. Again I’ve got a ‘big man’ for this unit, whose flamboyant uniform is very hussar-like with its golden frogging and fur-lined pelisse. I only have one limber for my artillery. I’d love to have one for each gun, but with all the equipment and horses, limber models are just so expensive, not to mention time-consuming to paint and put together! 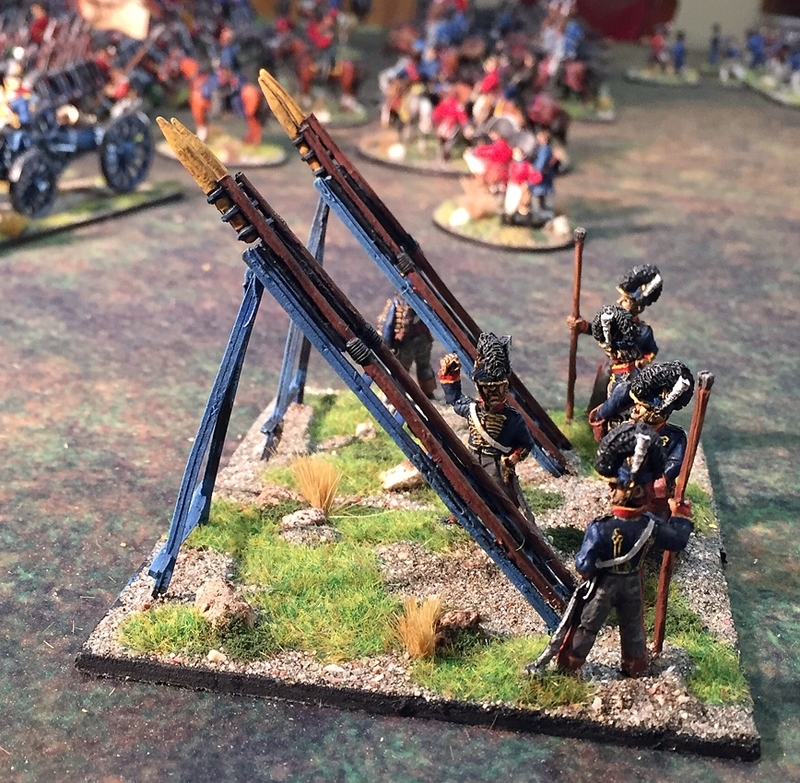 Part of the fun of wargaming with a British army is the ability to deploy rockets, as shown here with the 2nd Rocket Troop of the Royal Horse Artillery. These models I think were from Old Glory Miniatures. The Congreve rocket was a fearsome albeit unpredictable weapon. Different wargames rules replicate their sporadic accuracy in various ways, that can even include an out-of-control rocket endangering its own side! Along with Sharpe, another popular fictional character from this period is Horatio Hornblower. So adding a naval landing party to my British forces was a must! The sailors are from Wargames Foundry. They’re wearing a variety of clothing, and armed with a motley range of weapons. 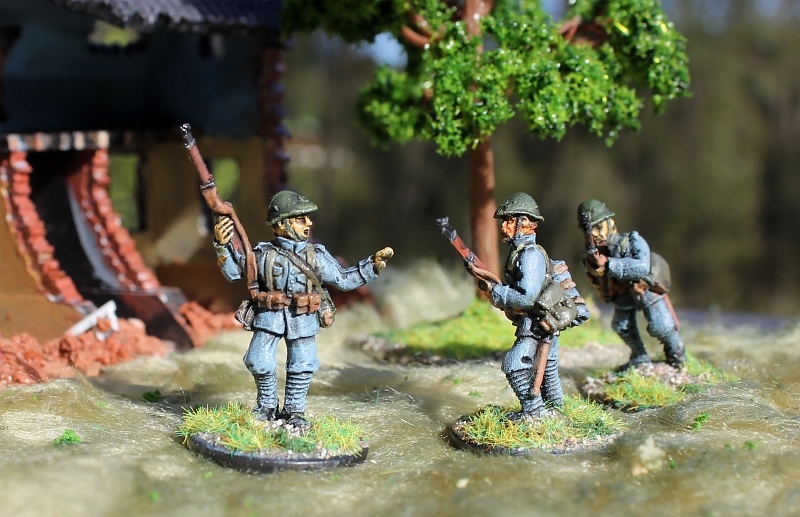 The two individually-based ‘big men’ are by Brigade Games Miniatures. The naval officer at the left represents Hornblower himself. The sailors are accompanied by a party of Royal Marines. 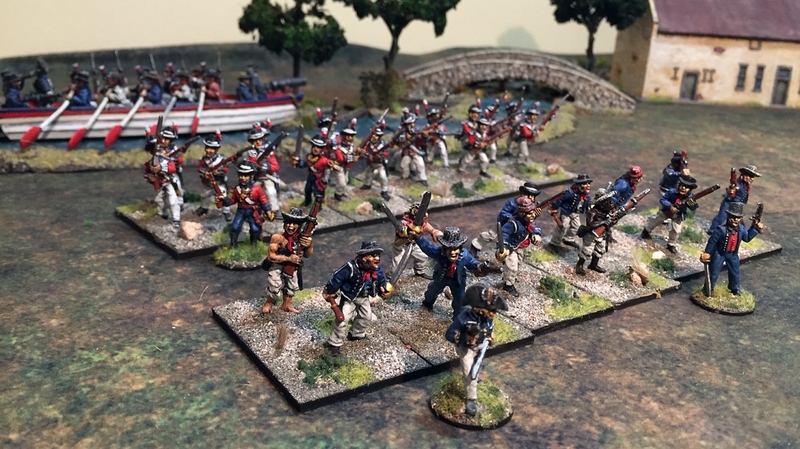 These figures are (I think) by Britannia Miniatures. The ‘big man’ is a Wargames Foundry figure, and is one of my favourite figures in the whole army – I really like his pose and natty uniform. Of course, a naval landing party has to have a boat to row them ashore. 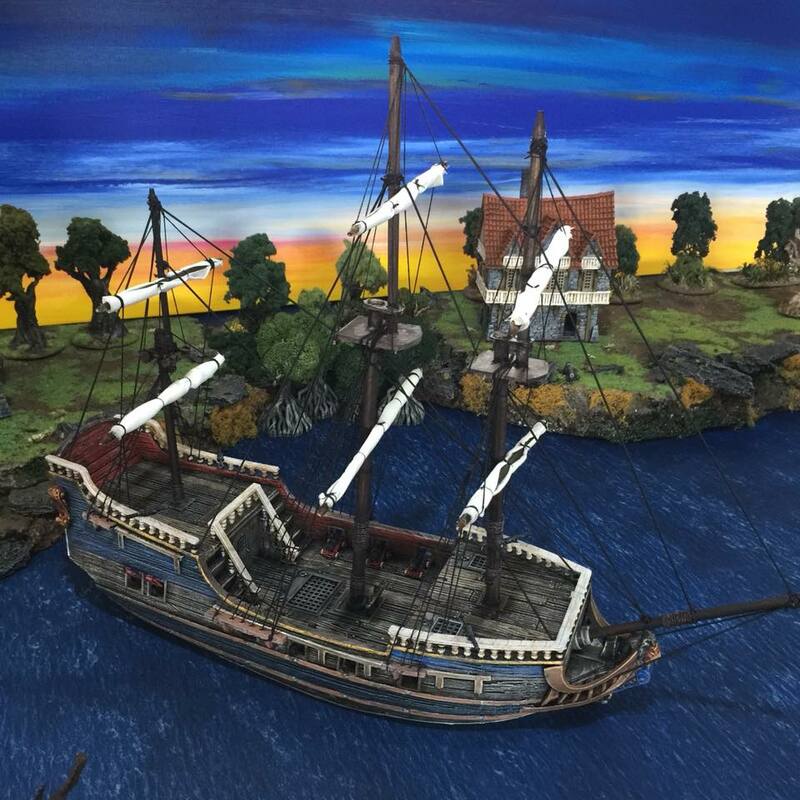 This impressive model is by Britannia Miniatures. Like the artillery limbers, it is an expensive luxury, as boats most likely won’t play an active part in a game. But as a model it is irresistible! 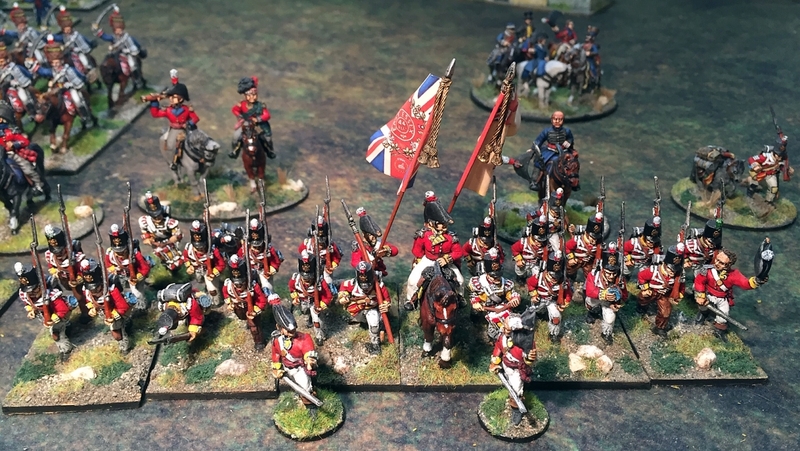 So that’s it – my entire British army, mostly painted between 2003 and about 2009. Keep watching for my next inspection parade of another army from my collection. Very impressive. Especially liked the 42nd. The real challenge with them is that the original kilt is so dark it basically turns into a black blob on the table. Yes, the tartan is only really visible from fairly close-up. But I still like that it is there! 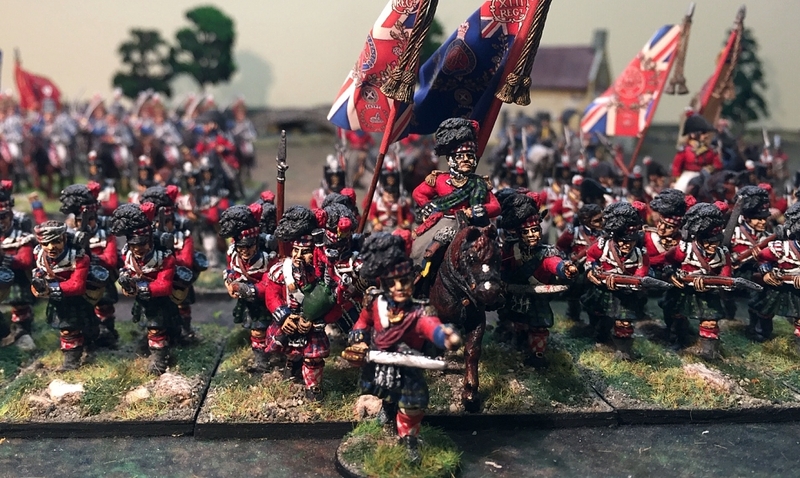 A lovely army that has a bit of everything from red coats and Highlanders to light troops, dashing cavalry and even rockets! I love the rockets. It’s a great idea to parade all of the troops every once in awhile. Thank you, Jim. I should be putting my Spaniards on parade in the next few days. Hi Valley Boy. I’m glad my blog was useful for you, though I suspect your knowledge of Napoleonics is much greater than mine! 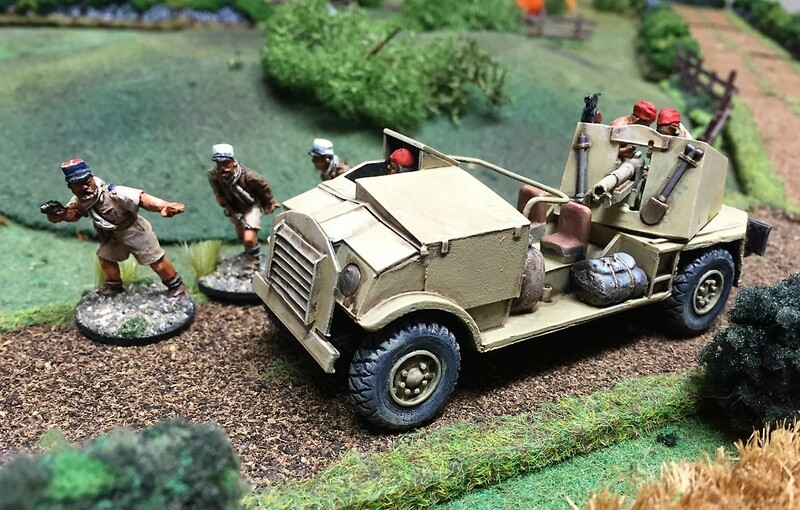 A beautiful collection Roly – Front Rank are amongst my favourite ranges of figures. 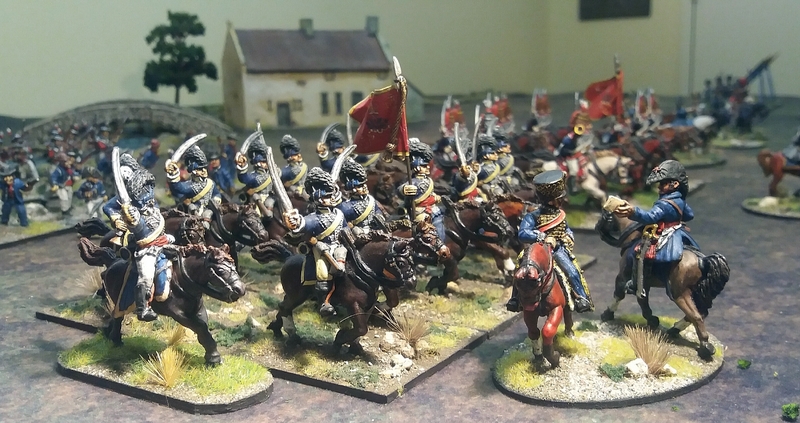 Funnily enough, I base my Napoleonics exactly the same way – except in my case I only have three figures per base for the line regiments. Putting the lights in twos has two attraction – aesthetically they look more “open order” and it also makes them simple to identify as lights or skirmishers on the table. That’s what I think, too, Keith. Though, in truth, they haven’t appeared too much on the table since they were painted, as I don’t actually get to play much. so wonderful figures! Great collection. Excellent ‘Trooping of the Colours,’ Roly. Another good reason for photographing your troops as a collective army is for insurance purposes. Hopefully you will never have to claim for them, as the thought of having to paint a replacement army on this scale is daunting. I hadn’t thought of that, Wayne – but you make a good point (both about insurance and also the prospect of ever having to start again from scratch!). A lovely army, and one that is standing the test of time. 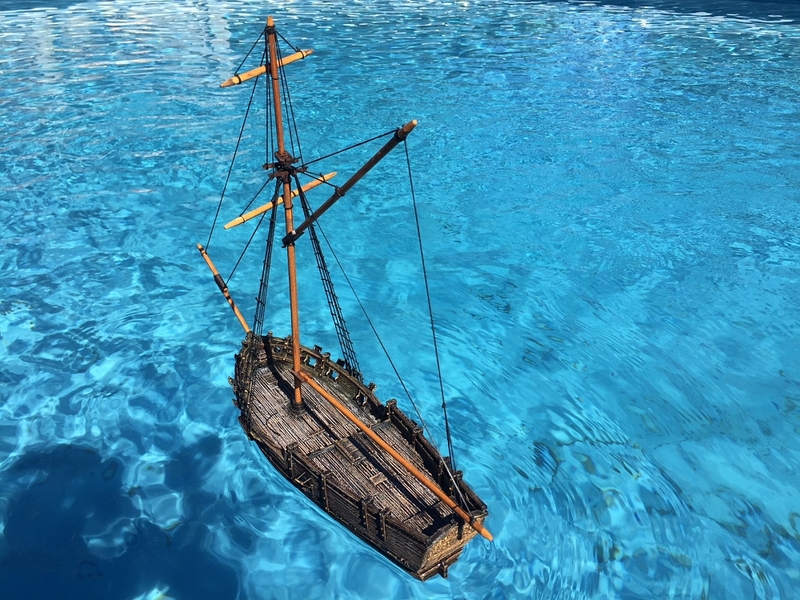 I love the boat and it made me feel a bit nostalgic for Britannia Miniatures (although Andy from Grubby Tanks is doing a great job with most of the range). Whoops, I didn’t mean to post the above comment anonymously! Yeah, the boat is a beauty. Very impressive to look at, albeit pretty useless in a game other than as eye-candy … and what better reason is there than that?! An excellent idea getting the chaps (and occasional chappess) out for parade. Such finery must surely get you salivating. A salute to you and your wee men (and occasional lady). 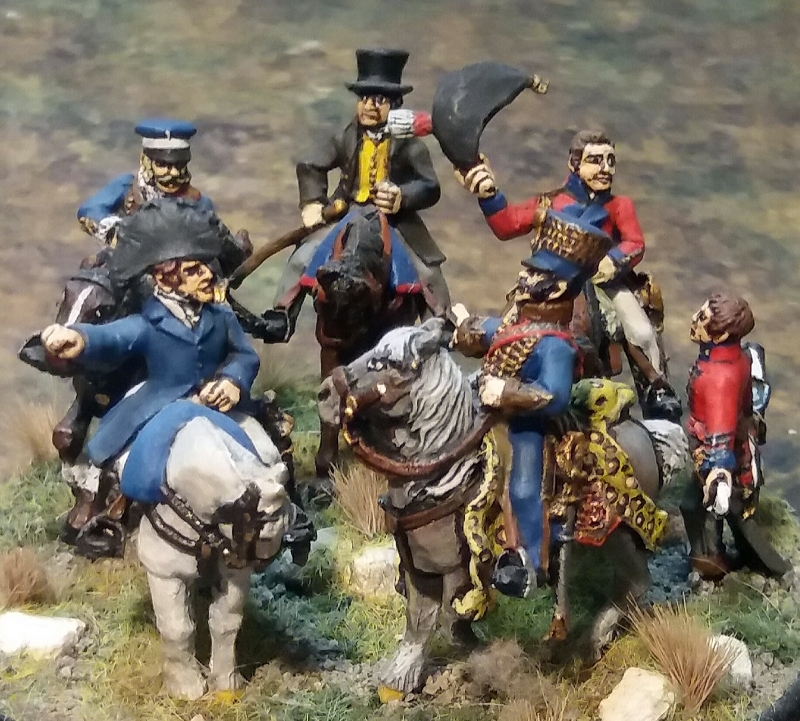 Have you been inspired enough to paint some more Napoleonic figures? Lovely looking army! 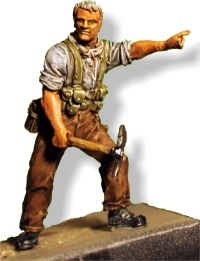 I really enjoy Front Rank miniatures. Yes, after all this time in wargaming, they’re still my favourites to paint. And I like their somewhat chunky style, too.